What’s better than a supernatural vampire story set in Salem, Mass. with a murder mystery mixed in? I don’t know about you, but I’m sold. I can’t wait to read GCC member Lucienne Diver’s latest installment in her Vamped series, FANGTABULOUS, out this month through Flux. Gina Covello and her band of federal fugitives are on the run after taking down a secret (and sinister) government facility. Strapped without cash or credit cards—a fate worse than death for Gina—the rebels must find a place to lay low. They roll into Salem, Massachusetts, the most haunted town in America and the only place they have friends flying under the radar. But within a day, Gina and her gang are embroiled in a murder mystery of the supernatural kind. Someone—or something—is strangling young women, and it’s rumored to be the ghost of Sheriff Corwin, late of the Salem Witch trials. Is it the ghostly Sheriff or is someone on this side of the veil using the famous story as a cover up? Gina is determined to get to the bottom of this mystery, and she needs to do it before a paranormal reporter on the scene exposes them for what they are…fanged federal fugitives. Lucienne: I’ve been a bridesmaid three times, and while none of the dresses was hideous, I’ve only reworn one of them—from my sister’s hippy wedding. You know it’s a hippy wedding when a) the band is the Deadbeats, a Grateful Dead cover group, b) people drink sangria out of great big Igloo coolers, c) guests run around barefoot, and d) have the best time ever! Lucienne: Whew, thank goodness the real-life people know that I took liberties with them, otherwise this question might get me into some trouble! I loosely model a lot of characters. For example, my hero Bobby reminds me a lot of my husband…mixed with a young Zac Efron! Another real-world character: Donato in Fangtabulous started with a friend of mine (Don “Vlad” Deich) who showed me around Salem and runs a gothic magic show there. Lucienne: I didn’t go looking for an editor, my agent did that for me, so in that sense finding an agent was harder. 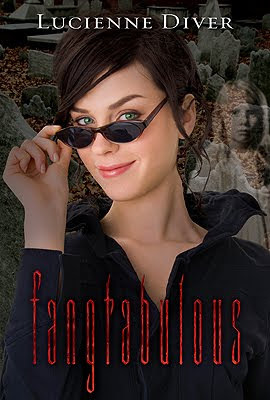 Lucienne: Fangtabulous is set in Salem, Massachusetts, which I think has to be the most haunted town in America. Certainly it’s the first place I’ve ever been to that almost had me believing in ghosts. (Okay, true confession: on the ghost tour I took, when we hit the house where Old Sheriff Corwin’s remains had been secreted away when his body was snatched, I was so creeped out by the sensation that something/someone was behind me that I had to put my back to a brick wall.) Anyway, I knew I wanted my fanged fugitives to hide out in Salem, where they might potentially blend in. When I visited the town to begin my research I didn’t have a clue yet as to actual plot. But digging deeper into the history and letting the sense of the place wash over me, a storyline began to form, one full of unsettled spirits and a few girls who weren’t so lucky, like I was, to escape with their lives. Lucienne: It was so far back that I don’t even remember, because Flux contracted me for books three and four in the Vamped series at the same time (and Fangtabulous is the fourth). Very likely it was in an airport. I seem to get all the good news for my work when I’m about to take off and there’s no time to share the good news with anyone except my seatmates, who tend to look at me funny when I squee suddenly. Thank you, Lucienne! Now, everyone go out and buy books, lots and lots of books! ‹ Starting the Year With Some Good Books!